Bought a swimming pass for the summer today and they gave me an extra week free. Their cleaner said she’d bring a cuppa to poolside for me when I come on my own. Spent a few hours with my friend and her funny toddlers while the girls were at school; stress free and a chance for a good chat. DD1 managed to tell her new LSA she doesn’t like being tickled. Wow! Took the girls out for tea tonight and they were in great moods. When we left not only did we get vouchers for a local attraction but they also gave me the girls’ meals for free. In the restaurant DD2 said “I’m full. Can I leave some ice cream?” Wow again! This morning I was greeted by the sight of a decapitated wild rabbit in the living room. Guilty cat nearby. Lucky me getting to pick up a bunny head and bunny body before breakfast. 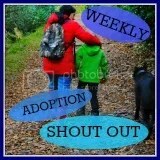 This entry was posted in Adoption, adoption and school, Family, Therapeutic Parenting and tagged adoption, adoption and school, Attachment, love on July 2, 2015 by 3girlstogether.